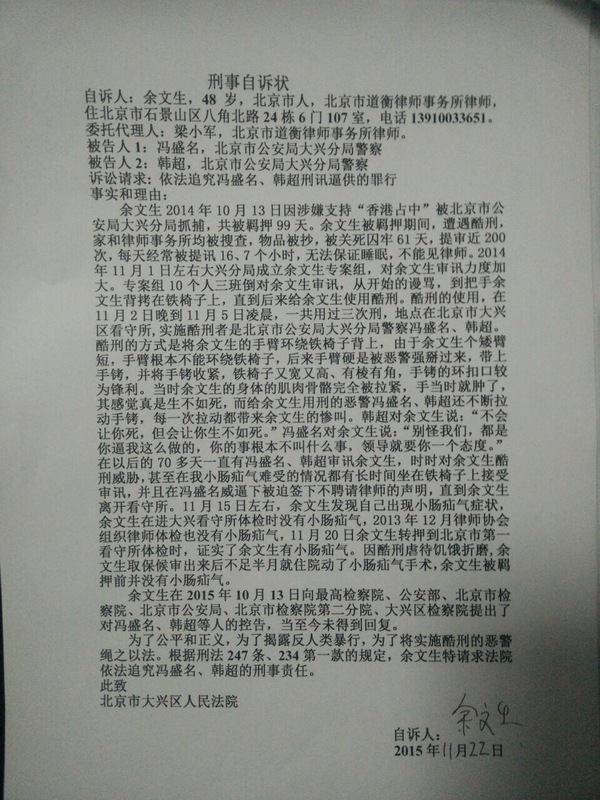 In his complaint to the Daxing District People’s Court, Beijing, Lawyer Yu Wensheng recounts his torture by two police officers during his 99-day detention. One of his torturers said to him: “I won’t let you die, but I will make you feel you’d rather be dead.” Yu was taken into custody on October 13, 2014, in connection with his support for “Occupy Central” in Hong Kong. Yu demands that the court investigate the criminal liability of his torturers. Plaintiff: Yu Wensheng, 48 years old, from Beijing, lawyer at Beijing Dao Heng Law Firm. Resides at Room 107, Door 6, Building 24, Bajiao North Road, Shijingshan District, Beijing. Phone number: 13910033651. I was taken away by the Daxing Branch of the Beijing Municipal Public Security Bureau on October 13, 2014, on suspicion of supporting “Hong Kong Occupy Central,” and was detained for a total of 99 days. During the detention period, I suffered torture, my residence and law firm were searched, and my belongings confiscated. I was detained in the death cell for 61 days, interrogated almost 200 times, frequently for 16-17 hours each day, deprived of sleep, and denied access to a lawyer. 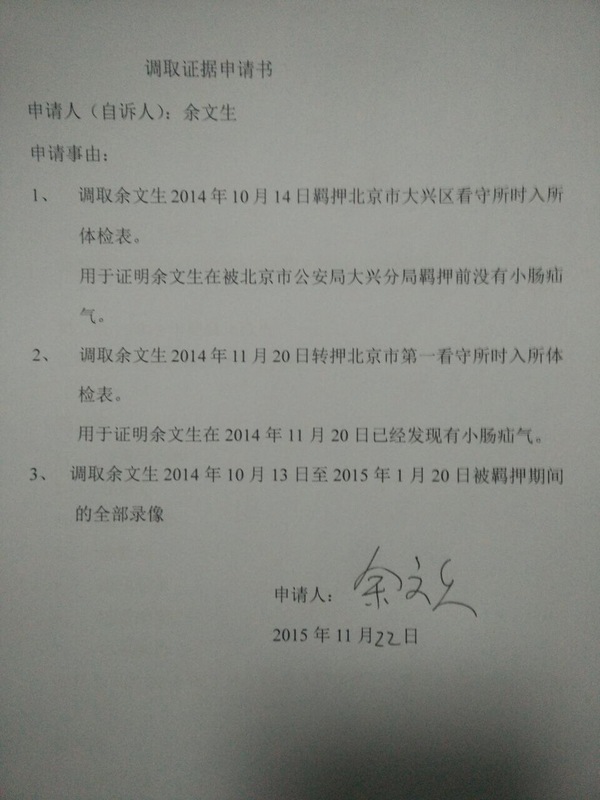 Around November 1, 2014, the Daxing branch set up a special investigation team for my case and intensified interrogation of me. The team’s ten members took turns interrogating me in three shifts. They started out cursing, then chained my hands behind my back to an iron chair, and later tortured me. Torture was used three times, from the evening of November 2 to the early morning of November 5, at the Beijing Municipal Daxing District Detention Center. The torturers were police officers Feng Shengming and Han Chao of the Daxing Branch of the Beijing Municipal Public Security Bureau. The torture took the form of forcing my arms to wrap around the back of the iron chair. Since I am a short person, and my arms were not along enough to wrap around the back of the chair, the vicious police officers forcibly pulled my arms back and cuffed them [around the back of the chair], and tightened the cuffs. The chair was wide and tall, and the corners pointed. The edges of the handcuffs were sharp. As my flesh and bones were stretched taut, my arms became swollen immediately, and I felt that I wished I were dead. The vicious police officers Feng Shengming and Han Chao kept pulling on the handcuffs, causing me to cry out in pain each time. Han Chao said to me: “I won’t let you die, but I will make you feel you’d rather be dead.” Feng Shengming said to me: “Don’t blame us. You’re the one forcing me to do this. What you did was of no importance. Our boss just wanted you to admit you were wrong.” In all the 70 some days afterwards, both Feng Shengming and Han Chao had a part in interrogating me, frequently threatening to torture me. Even when I was suffering from an intestinal hernia, I was made to sit on the iron chair for long stretches of time being interrogated. Under threats, I was made to sign a pledge that I would not hire a lawyer, before I was able to leave the detention center. Around November 15, I discovered that I had developed the symptoms of an intestinal hernia. 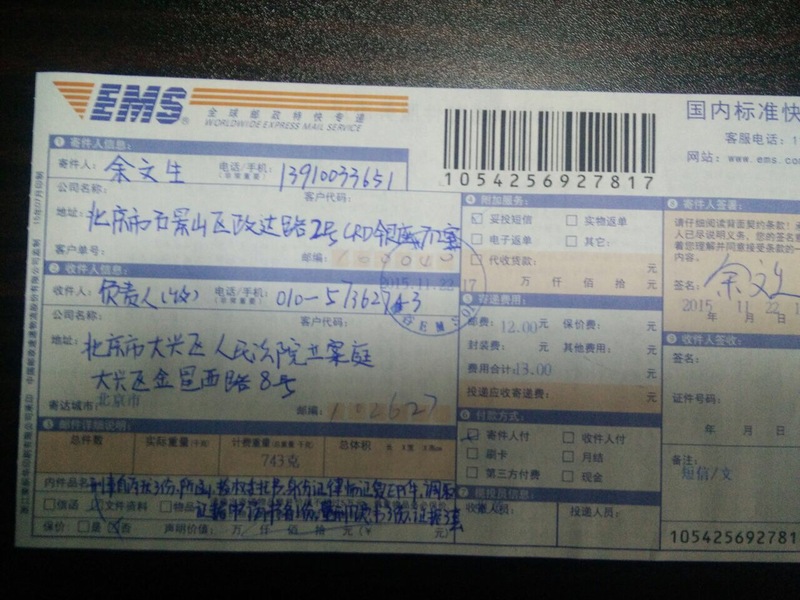 When I entered the Daxing Detention Center, my physical examination showed that I did not have that condition. Previously, in a lawyers’ association physical examination done in December 2013, there had been no indication of the condition either. On November 20, , when I was transferred to the Beijing No. 1 Detention Center, the physical examination there confirmed that I had an intestinal hernia. As a result of torture, ill-treatment, food deprivation, and other forms of torment, I was admitted to the hospital for intestinal hernia surgery less than six months after I was released on bail pending further investigation. Prior to being taken into custody, I did not have an intestinal hernia. 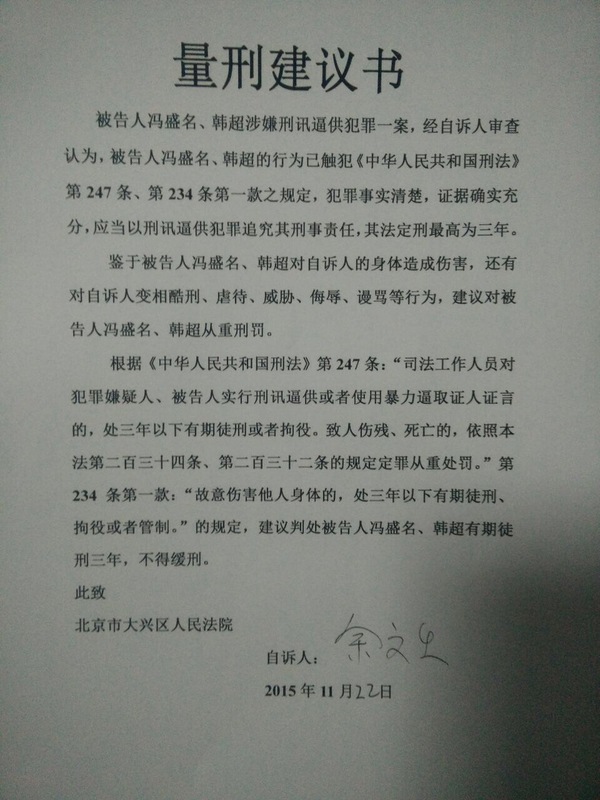 On October 13, 2015, I submitted a complaint against Feng Shengming, Han Chao, and others to the Supreme People’s Procuratorate, Ministry of Public Security, Beijing Municipal Procuratorate, Beijing Municipal Public Security Bureau, No. 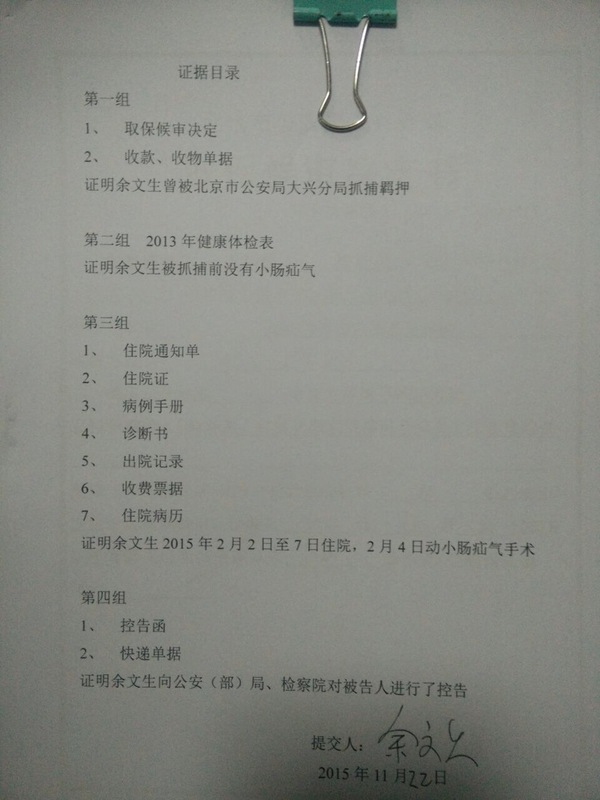 2 Branch of the Beijing Municipal Procuratorate, and the Daxing District Procuratorate, and have not received any responses to date. For fairness and justice, in order to expose atrocities against humanity and punish the vicious police officers who carried out torture, and in accordance with the provisions of Article 247 and Article 234, para 1 of the Criminal Law, I hereby request the court to investigate the criminal liability of Feng Shengming and Han Chao.